All right! We all need to know where to eat more than almost anything else, right? Thanks to skywalks that connect several downtown buildings, the Hyatt has a heck of a lot of choices without even having to go outside. Early May in Atlanta shouldn’t be too sweltering, but it’s likely to be pretty warm and humid. Staying in the air conditioning is a good thing. We’ll start with the hotel’s four restaurants. Twenty-Two Stories, the lobby bar, is also a gastropub, with “elevated” bar food in addition to the full bar and specialty cocktails. Sway, just inside the front doors, is a full-service restaurant featuring Southern-focused cuisine. Market is a 24-hour, quick-service spot tucked into the corner of the lobby, offering premade sandwiches and other light meals and serving Starbucks coffee. And up top, on the 22nd floor, is Polaris, a high-end, revolving classic Atlanta restaurant. The hotel also has room service, though only for breakfast and dinner. 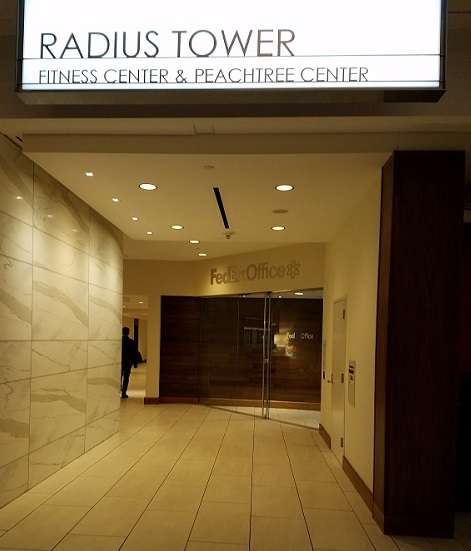 One of the best things about the Hyatt, though, is that it connects directly to the Peachtree Plaza Food Court. 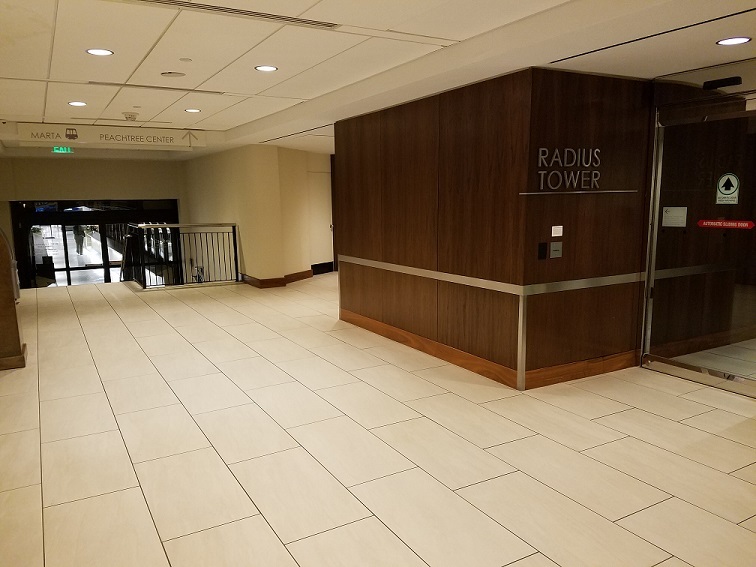 Just take the hallway marked Radius Tower, between Twenty-Two Stories and the reservations desk (see image), and at the end you’ll find a number of fast-food and quick-service restaurants, as well as several nicer sit-down restaurants. Be aware, however, that a lot of these places are only open during the day, since they’re designed to serve the businesses in the area. The Hyatt also has a skywalk that leads to the Marriott Marquis across the street. The entrance is between the bar and the café in the lobby. The skywalk takes you into the Atrium level of the Marriott, which has a bar in the center and two full-service restaurants: High Velocity, a bar and grill; and Sear, a high-end steak restaurant. From there, go down one level to the lobby, and there’s a Starbucks and an M Store that sells prepared sandwiches and snacks. And there’s yet another skywalk from the Marriott to the Hilton! Go down one more level from the lobby, to the Marquis level, at the back side of the hotel to find the skywalk. That will take you into the second floor of the Hilton. Go down one level for the lobby restaurant, called Southern Elements, and a Marketplace with prepared sandwiches and the like. Down one more level is Trader Vic’s, a Polynesian restaurant and bar, and up on the roof is Nikolai’s Roof, a fine dining restaurant. Next up: I’ll cover some of the other restaurants in the area near the hotel—many of them within walking distance. Thank you so much for posting this info!